A Strategy Map is a diagram that is used to describe the primary strategic goals that are important to an organization or business team. The diagram shows four important perspectives that are the significant questions that provide the definition of a strategy. The most commonly defined perspectives are: ‘Financial’, ‘Customer’, ‘Internal Business Processes’, ‘Learning and Growth’. The diagram is used as a communication device to ensure there is a common understanding of the strategy, to focus organization effort and to assist with the assessment of progress. The Strategy Map is used to model the key strategic goals that an organization or management team intend to achieve. Elements in each of the four perspectives can be linked to other elements in the repository to show how they could be implemented at a business, application or technology level. 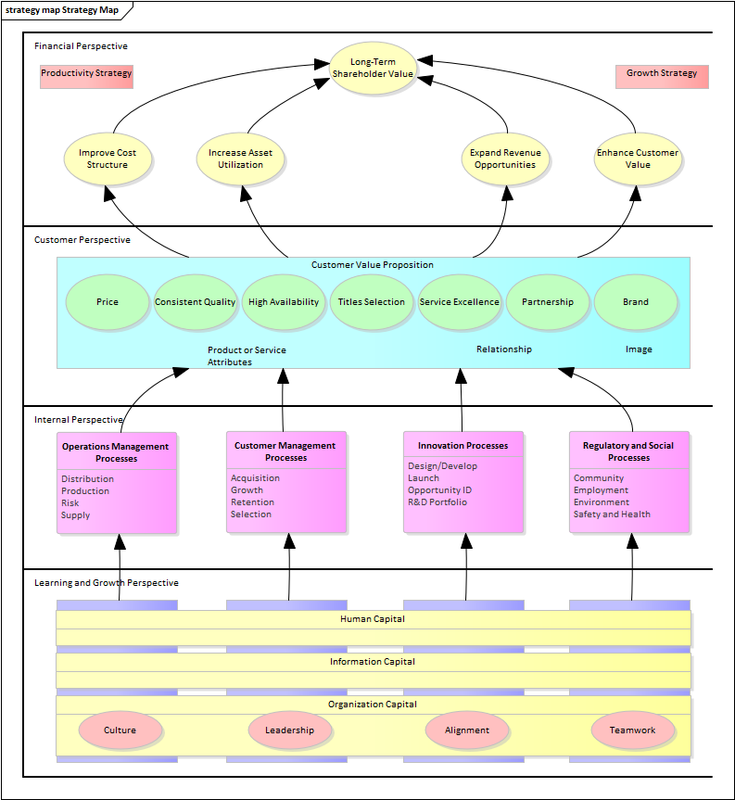 A Strategy Map can be created using Patterns that automatically create elements and a diagram that can be used as a starting point for the strategy map. There are three Patterns available, ranging from a very simple expression with a single element in each perspective to a completely worked expression with multiple elements in each perspective. A toolbox provides a range of additional elements and relationships to extend the base maps created using the Patterns.